Botanical Description: Salmonberry is a deciduous shrub, 1-4 m tall, with erect or arching stems. The stems are often prickly in stages of new growth. Deep pink and rose coloured flowers bloom February to March, and grow singly up to about 3 cm. 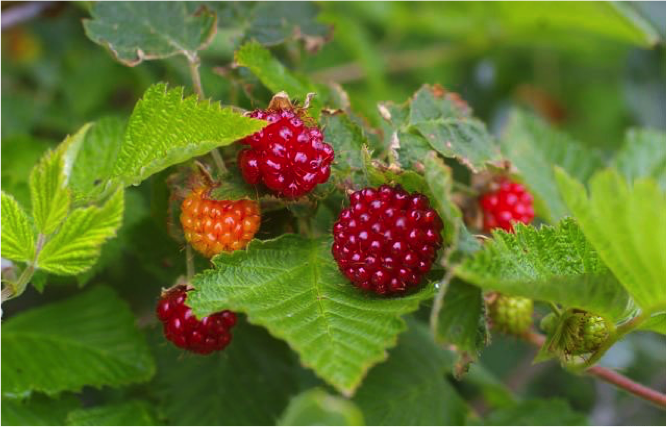 Large fruits ripen May to June, and resemble raspberries and vary in colour and taste depending on individual plant and location. Current Distribution and Local Habitat(s): The current range of Salmonberries is along western North America, from northwestern California to Alaska, between the Cascades and the coast. Salmonberry can be found growing with Elderberry, sword ferns, evergreen huckleberry, and fireweed. Salmonberries are found in a wide range of habitats, especially wetland or riparian areas. It can also be found in open areas, often after disturbance events. 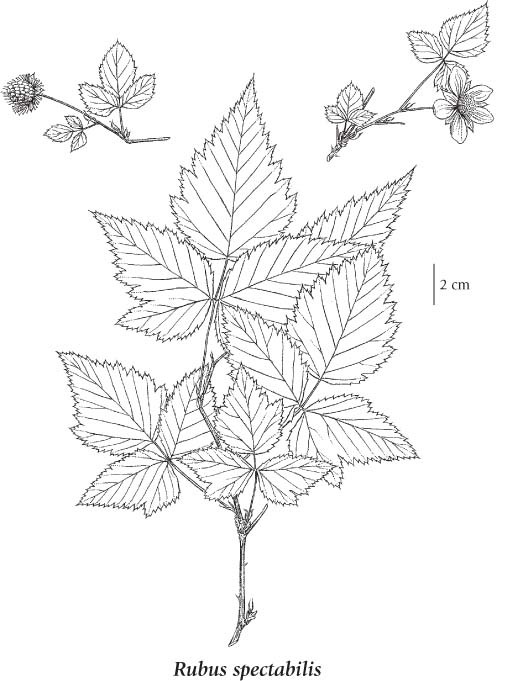 Ethnobotanical Application(s): Salmonberries were a popular plant among First Nations people. As a food source, Salmonberry was equally important. In spring, the sprouts were peeled and eaten raw with salmon meat or dried salmon spawn – hence the name. Sprouts were harvested from April to early June, and could be tied together and pit cooked. Nuu-chah-nulth peoples would boil the leaves with fish as flavouring. The berries were eaten fresh, as they are too juicy to dry into cakes for winter use. As they were the first to ripen in spring, they were often picked and served with oolichan grease at feasts. In some nations along the Pacific Northwest, families could “own” stands of Salmonberry. They reserved the right to the first and second rounds of picking. This initial, and generally bountiful, harvest was used for a feast, after which the patch was open to all people.An infusion of the roots was used to stimulate the appetite and promote weight gain. The bark has an astringent quality in the bark and leaves. Using the leaves, an infusion was administered to treat anemia, to shorten an overly long menstrual period and to ease labor pains. Dried leaves were chewed to cure diarrhea and stomach upset. Uvic Campus Location(s): Bowker Creek headwaters, Mystic Vale, riparian areas, and wetlands. Plants.usda.gov. 2016. PFS: Salmonberry. Retrieved: https://plants.usda.gov/plantguide/pdf/cs_rusp.pdf.